The skin is probably the most important part of the tonbak, where different sounds are produced with the fingers. 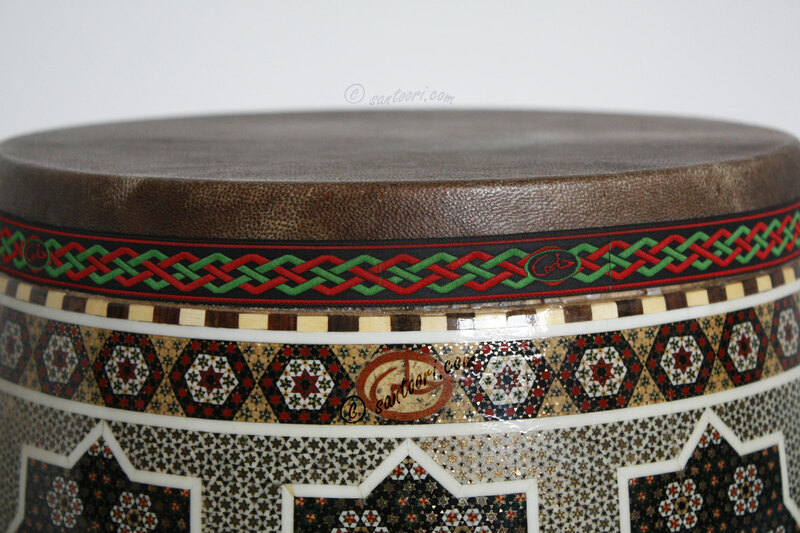 The tonbak is one of the rare hand-drums of the world on which a player employs all ten fingers to create the various patterns. Many types of skin have been used on the tonbak: goat, ewe, lamb, deer, fish, ibex, camel and even horse skin. It is generally believed that aged goat and ewe skins are better and more suitable than the others. a) The skin should not be new. In order to test this, pour water over the skin. When wet, a new skin will give off a malodorous stench. New skins must be hung and dried for some years before they can be used for tonbaks. b) The thickness of the skin should be uniform. When the thickness of the skin is not uniform, then the sound of the tonbak will not be uniform - the snap (pelang) of the free and the non-free hand will be high and low. Other reasons for this problem include non-uniform tensioning of the skin and a lack of mathematical circularity of the large opening of the tonbak. c) The color of the skin should also be uniform, i.e. the color of some parts of the skin should not be significantly lighter than the other parts. d) Although some tanners use lime to speed the tanning process, lime and other chemicals will not produce the desired result. This is the most important consideration. The skin should be put immersed in water for a lengthy period of time, after which the wool may be easily removed. a) When the pitch of the tonbak is unusually high (as when the skin has been overheated or the weather is very hot and dry), never wet the skin with water. This will damage the skin if done too many times. It is better to put the tonbak upside-down on the floor (stone, marble or mosaic), and then the skin of the tonbak will absorb the moisture of the ground gradually and the pitch of the tonbak will normalize. b) When the pitch of the tonbak is unusually low (for example, when the weather is very humid and cold) never heat the skin of the tonbak directly in front of the fire. This will also damage the skin if done too often. It is better to heat the small opening of the tonbak. In this way, the inner space of the drum will become warmer gradually and then the pitch of the tonbak will be normal. c) Never play the tonbak when your hands are dirty. Not only will this affect how you play, but a soiled skin will lose resonance. d) To minimize problems, store the tonbak in a wooden case that has been lined with soft fabric. Tonbaks have traditionally been carved from a variety of tree types: walnut (in Persian, 'gerdu'), mulberry ('tut'), ash ('zaban-gonjeshk'), oriental plane ('chenar'), pine ('kaj') and many others. Walnut and mulberry trees are considered to be far better than the others. Traditionally, goat and fish skins were preferred for ghavals, though ewe, lamb, deer, and ibex skins have also been used. Natural-skinned ghavals are rarely used today, having been supplanted in the last few years by the popular synthetic ghavals. The frame of the ghaval may be from the wood of a variety of trees, but walnut ('gerdu') is preferred. Sheep, goat, ewe, deer and ibex skins been used for the daf, but it is believed that goatskin, sheep skin and deerskin are better and more suitable than the others. Today, both natural-skin and synthetic daf are popular. Most of the points about the skin of the tonbak are true for the skin of the ghaval and the daf. But it is useful to know how to heat the skin of the ghaval or the daf. The wood of the daf frame should be very hard and should crackle. The wood of the willow (in Persian, 'bid') tree is very popular. It is better not to heat the skin of the ghaval or the daf very much, because this will eventually damage the skin. If it becomes necessary to do so, experienced ghaval and daf players recommend heating the frame first, then heating the skin in front of, but at some distance from the heat source. After heating the skin, oscillate the ghaval or the daf like a pendulum in the air. It is believed that this action keeps the pitch of the heated ghaval or daf fixed for some time. Sudden temperature changes may cause the skin of the ghaval or daf to curve. [B]: Arfan Beomid-e-Hagh, The School of Playing Daf, Ebteda Publication, Tehran, 1998. [N1]: Peyman Nasehpour, Personal Interview with Ostad Latif Tahmasebi-zadeh (Master of Ghaval), Tehran, 2002. [N2]: Peyman Nasehpour, Personal Interview with Ostad Mirza Agha Ghosi (Master of Daf), 2002. [R]: Rajabi, B., Tonbak va Negareshi be Ritm az Zavaya-ye-Mokhtalef, Tehran, 1977. 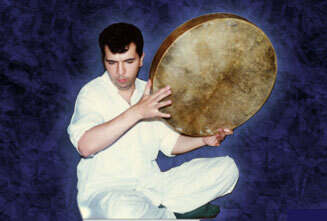 [TE]: Hosain Tehrani, Amouzesh-e-Tombak (Tombak Rudiment), Tehran, 1970. [TO]: Emad Tohidy, An Introduction to Daf Playing, Kerman Music Society, Third Publication, 1994. Date of Publication: First 12th April, 2002.